Know before you go! Check out current surf conditions along (most) of the Texas coast. I am excited to present collaborative work with Rice Sedimentology and Rose Palermo at AGU 2018! During sea-level rise, coastal barriers (islands and peninsulas) are thought to respond by retreating landward. However, bay accommodation may (1) vary in bay depth (ΔDb) (2) be subjected to variation in rates of RSLR (relative sea-level rise, ΔRSLR), or (3) both bay depth and rates of RSLR may vary (ΔDb & ΔRSLR). Variable bay morphology may drive alongshore changes in retreat rate, generating shoreline curvature, and modifying longshore transport. The videos below are a supplement for our 2018 AGU poster, which is available as a PDF. Click on the embedded links to view Low Case (2.9 mm yr-1 RSLR, 29 m2 yr-1 Qowmax) and High Case (10 mm yr-1 RSLR, 100 m2 yr-1 Qowmax) cases. I am beyond excited to present highly collaborative work that begins to parse records of autogenic processes and allogenic forcings preserved within set-scale aeolian architecture in two companion articles: (1) numerical experiments (preprint) and (2) the scour-fill dominated Jurassic Page Sandstone, Arizona (preprint). Set-scale aeolian architecture from a numerical model of dynamic dune topography driven by steady allogenic boundary conditions. Color represents time of deposition. In the first companion article, a reduced complexity model of aeolian dune strata-formation is developed and applied to explore the roles of autogenic processes on the preservation of allogenic sourced from three sets of external environmental forcing. In each scenario, rapid dune growth is found to completely cannibalize early dune deposits, thus shredding any records of early allogenic or autogenic signals. However, later dune deposits are found to contain commingled autogenic and allogenic signals. This theoretical work frames five working hypotheses surrounding the nature of aeolian dune deposits for future workers to explore and discuss! The source code (Matlab) will reproduce all figures in this article is available here. A Python version is planned. Page Sandstone. Early dune deposits (smaller sets in B,D) are preferentially preserved in antecedent lows in paleotopography. In the companion article, collaborator Benjamin Cardenas leads interpretation of set-scale aeolian architecture within multiple exposures of the Page Sandstone (Jurassic) near Page Arizona, USA. This work interprets the set-scale architecture of the Page Sandstone to record multiple transgressions of the Carmel Sea. Drying, and associated decreases in base-level between transgressions liberates significant quantities of sand. After drying, dune growth and scour are interpreted to cannibalize early dune deposits, except for those created in antecedent lows in paleotopography. Ongoing dune motion in the dry sand sea creates scour and fill architecture which is thought to characterize autogenic dune behavior. Eventually, the Carmel Sea completely transgresses the sand accumulation, and shuts down the aeolian system at the end of the Page (pun intended). Many thanks are owed to the CoRE group (Especially Zane Jobe) at the Department of Geology and Geological Engineering at the Colorado School of Mines for inviting me to give a departmental seminar in their Van Tuyl lecture series. For this seminar, we will explore the response of the expansive system of barrier islands and peninsulas along the Texas coast to a wide survey of sea-level rise rates and barrier overwash configurations. As always, please feel free to download a PDF of the presentation! In celebration of Dr. John Anderson‘s upcoming retirement at Rice University, I have the privilege of giving a short research talk during an all-day research symposium, appropriately entitled JohnFest!. JohnFest! is composed of a series of talks given by John’s past and present students and post-docs. For this special occasion, I am excited to be presenting my postdoctoral work, which John has supported and mentored over the past year and a half, a reduced complexity model of Texas’ coastal barrier system. Author traviseswansonPosted on April 21, 2018 April 24, 2018 Categories Geomorphology, SedimentologyTags climate change, fluid mechanics, model, sea level rise, sediment transport, texas coastLeave a comment on JohnFest 2018! 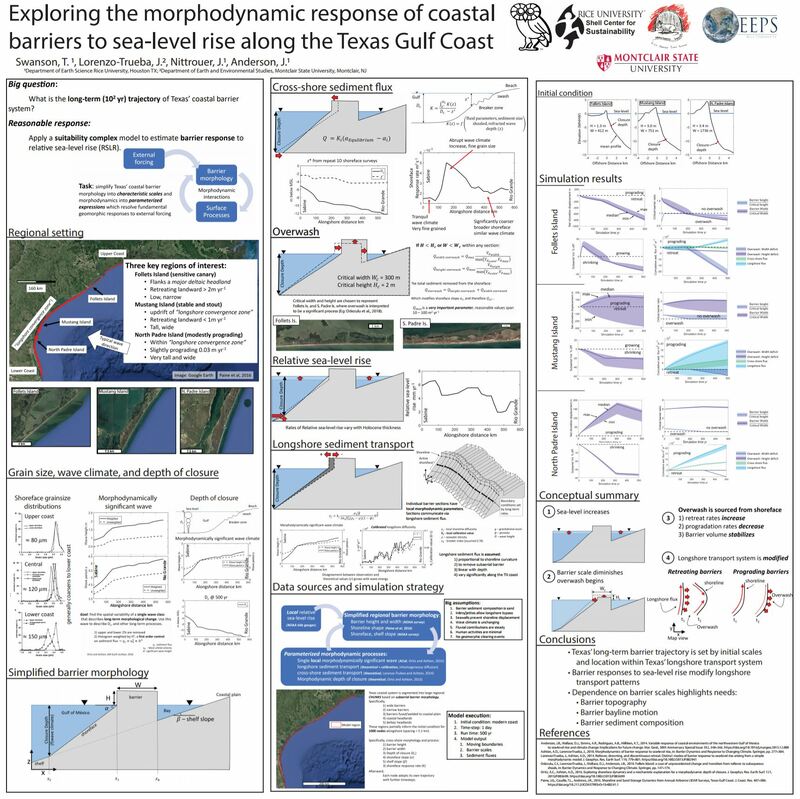 Just in time for the Industry-Rice Earth Science Symposium 2018, the newest iteration of the reduced complexity coastal barrier model was summarized as a poster presentation. Be sure to click on the image to the right to download a high resolution jpeg image of the poster! Abstract: A reduced complexity model aeolian dune stratification model is developed and applied to explore the role of dune morphodynamics in the creation of synthetic sections of aeolian stratigraphy and shredding of environmental signals originating from three sets of environmental forcing: 1) steady transport capacity, 2) steady bed aggradation and variable transport capacity, and 3) steady transport capacity and bed aggradation. In each scenario, the forward motion of initial, highly disorganized dunes generates a significant record exclusively containing autogenic signals that arise from early dune growth, deformation, and merger. However, continued dune growth scours deeply, and shreds all records of early dunes. Afterward, dunes self-organize into groups of dunes. Forward motion of dune groups create, truncate, and amalgamate sets and co-sets of cross-strata, quickly forming a second, significantly more robust stratigraphic record, which preserves a comingling of signals sourced from ongoing autogenic processes and each scenario’s specific set of environmental forcings. Although the importance of self-organization on modeled aeolian stratification is clear in the few presented scenarios, self-organization maybe throttled via variability within environmental forcings. Therefore, additional work is warranted as this numerical experiment only begins to sample possible sets of environmental forcing, boundary conditions, and initial conditions, geomorphic responses, and consequential preservation. The videos below so the co-evolution of dune topography and stratigraphy for three different model scenarios. In each video, bedform stratigraphy is vertically exaggerated 100x. Additionally, bedform topography is reduced 20x. η* and x* are non-dimensional vertical and horizontal scales, respectively. η* represents the fraction of equilibrium dune height, and similarly, x* represents the number of equilibrium dune wavelengths. Enjoy!